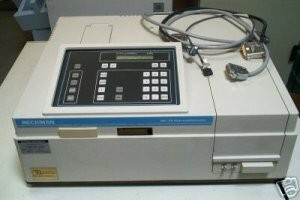 Beckman Coulter DU-64 UV-VIS spectrophotometer. A fast scanning spectrophotometer designed to simplify wavelength scanning and provide a reliable source of absorbance readings. Readings in Absorbance or Transmission. I am looking for Beckaman Coulter DU-64 Manual book. Is there any chance someone help me get that? Thank you. Is there a standard crt terminal that could display what the dot matrix printer normally prints from this machine ? There are no threads in Hach Company DU-64 Reviews at this time.